One of these “followers” is identified later in the story as Cleopas. He may be the same man who’s wife was with Mary and the others at the foot of the cross. She may even have been one of the women who went to the tomb three days later (early this same day). So perhaps these two followers on the road back home to Emmaus have been eyewitnesses to the death and even the resurrection of Christ. Here they are walking away from the public execution of their hope. Then, three days later his body is missing. What’s going on? There are reports that mysterious visitors were also at the tomb this morning. These two members of the inner circle are talking and trying to make sense of so much that happened so fast. Their minds, hearts and fears are in turmoil. Now, we come upon them as they’ve set off on a 2-3 hour hike back to the comfort and safety of home. What else was there to do? Here they are like so many of us, walking down that same old path. They are running away from what they have mistaken for defeat. They are putting all the pieces together. Can you imagine what they must have been talking about, trying to figure out and wrap their faith around? Every now and then I wake up and realize that I’m walking away from the real answers I need to find. I’m heading out to what makes sense, what seems safe, where I feel at home. I want to find my own version of the truth that fits nicely into my carefully constructed life (such as it is). 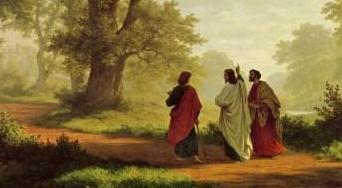 My walk of faith is on autopilot, walking back to Emmaus as I’ve done a hundred times before. How many times have you walked away from the risk of faith and stayed home where dreams never do come true? Now, as they try and piece together their dashed hope during a retreat down this familiar old road, someone comes along and joins them, and nothing will ever be the same.